Do you want a basic meatloaf recipe that's amazing? I also offer a tasty sweet and sour meatloaf below. The real trick to making perfect meatloaf is not hard. Don't work the meat hard - a tender touch when mixing really makes a difference. PREHEAT oven to 350 degrees and lightly grease a 5x9 inch loaf pan. In a mixing bowl, mix thoroughly all meatloaf ingredients and shape into a loaf. Mix the sauce ingredients together and spoon on top. Bake in preheated oven for 1 hour and drain the grease in the pan twice during baking time. This homemade meatloaf recipe is delicious - it's a winner at my house; especially on a chilly night. I am giving you the basics to make this easy meatloaf recipe; season it more or less, it's up to you. Make sure you serve with mashed potatoes. It's comfort food at it's finest. For this basic meatloaf recipe you may substitute ketchup for the steak sauce and bread crumbs for the stuffing mix. It's totally up to you. PREHEAT oven to 350 degrees and lightly grease loaf pan. Put the ground beef in a large bowl. Add the remaining ingredients and toss carefully to mix. If the meat is handled too much, your meat loaf will be tougher. Place the mixture into the loaf pan and bake for 1 hour. Drain the grease and serve. Whisk together in a small saucepan and bring to a boil. Pour over meatloaf and bake. Make sure you have homemade bread and mashed potatoes. 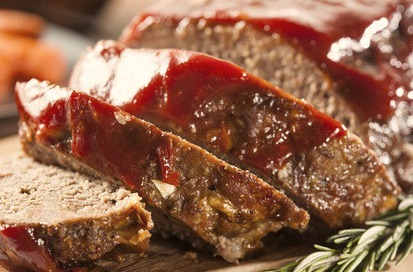 This another basic meatloaf recipe that has a different twist. Anyone who tries it loves it. For parties, make meatballs instead of the loaf, bake them and place in a crock pot with the sauce doubled. In a large bowl combine the beef, sausage, cheese, bread crumbs, sea salt, pepper, eggs, onion flakes, and 1/2 of one of the 15oz cans of tomato sauce. Mix together carefully - not to overwork the meat, as it will toughen it. Pat into a loaf and place in a large casserole dish. Bake for 45 minutes. In the meantime, in a saucepan over medium heat; combine the remaining tomato sauce and 1/2 of the unopened can. (You will have 1/2 of a can of sauce leftover that will not be used in this recipe) Add the brown sugar, vinegar, white sugar, and mustard. Bring to a slow boil and remove from the heat. After the meatloaf is done, remove from the oven and carefully drain the fat from the pan. Now pour the sauce over the top of the meatloaf. Return to the oven and reduce heat to 350 degrees and bake an additional 20 minutes. Let sit for five minutes before serving. This is so much more than a basic meatloaf recipe. It's comfort food at it's best. PREHEAT oven to 350 degrees and spray a loaf pan with vegetable oil. Mix by hand the meatloaf ingredients in a large bowl. Shape into an 8x4 inch loaf pan. Bake for 1 hour, or until done. Remove from oven. To prepare the gravy, melt the butter in a saucepan over medium heat. Add mushrooms and onions and sprinkle with the garlic and onion powders. Saute until tender. Add beef broth, beef bouillon and simmer for 10 minutes, stirring occasionally. Combine the water with the cornstarch and add to the mixture, stirring well until gravy thickens. 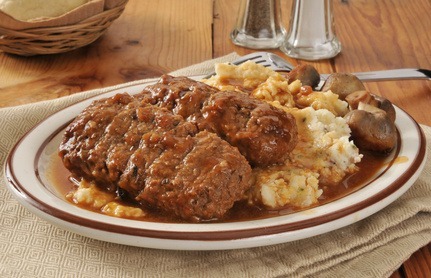 Serve over meatloaf with mashed potatoes and fresh homemade bread. I have more than a basic meatloaf recipe, please check out more of my homemade dinner ideas below.